Gemstones that display unusual optical properties are known as phenomenal gems. The phenomenal gems includes those that display properties such as asterism (the star effect) or chatoyancy (the cat's eye effect). One of the more unusual and mysterious optical effects is known as adularesence. Adularesence refers to a glow or luster that seems to emanate from below the surface of the gem. The glow appears to move as the light moves, producing a shimmering effect thought to resemble lunar light on water. This phenomena is especially associated with moonstone, and indeed the name adularesence dervies from adularia, a name used for the orthoclase crystals that comprise moonstone. Moonstone is actually made up of two different feldspar minerals -- orthoclase and albite. When the mineral forms they separate into a stack of alternating layers. When light hits these layers it scatters in multiple directions which produces the adularescent effect. The shimmering light may be white or blue, depending on the thickness of the layers (thinner layers produces a bluish effect). Moonstone occurs in a range of colors, including white, gray, brown, yellow, orange, green, pink and blue. The blue moonstone is sometimes referred to as rainbow moonstone because of its distinctive sheen. 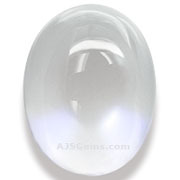 Moonstone clarity varies from translucent to opaque, with the higher quality material having some translucency. Moonstone is slightly soft -- 6 on the Mohs hardness scale -- so it is not suitable for everyday wear rings. It is best set in earrings, pendants or occasional wear rings with protective settings. Moonstone is one of the traditional birthstones for the month of June, along with pearl. Moonstone has been treasured by many cultures for its mystical and feminine qualities, Historically it has always been fashioned in the form of cabochons with a high dome, since this maximizes the adularescence. 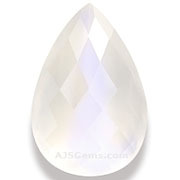 But you will sometimes see high quality moonstone cut with facets. Moonstone is found in many locations around the world, including Sri Lanka, Myanmar, India, Tanzania, Madagascar, Brazil and Australia. Most moonstone is white or gray, with other colors coming mainly from India.